The long-running theatrical show “I, Gina” is now spreading its wings at the Sydney Morning Herald. One thing we need to make clear, just so we’re not surprised or shocked: Gina Reinhart does not understand democracy, nor does she care one bit about the future of the nation–except, of course, in the way the nation can help promote the “I, Gina” drama, at the expense of the rest of the peons who scurry about her ankles. For billionaires, it’s always about them. Their power. Their wealth. Their control. But, no, this is not about not hearing other voices. It’s about not caring. The “I, Gina” show, a love affair with oneself, has no interest in a Media Charter of Editorial Independence because it contains words like “city”, “state”, “nation”, “integrity” and “independence”–all of which convey the radical idea that the space we occupy is bigger that “I”. Does not compute! Of course, that the “I, Gina” show can rampage through the country is the logical end result to promoting a belief that, for the sake of the glorious “free market”, rich people can do as they please. Mostly. Four beers into the barbeque and the host is waxing lyrical. He launches into to a joke about a certain ethnic group and their driving ability. It’s vaguely amusing and there is no one around from said group to offend. He gathers up some steam, he’s run out of punch-lines but starts making his views known on the cleanliness and dress habits of another demographic. There is a surly edge to the comments, but, again, everyone who is listening falls outside the group he is mouthing off at. Next day at work you see him chipping away at the Indian colleague in the staffroom, nothing too threatening, just a cajoling that could be dismissed as harmless banter until you saw the look on the guy’s face. Here’s the challenge – at what point has your mate crossed the R-line into racism – and once its been crossed, what should you do? This hasn’t been a process of casual eaves-dropping, I’m paid to run focus groups, where a group of punters are invited to sit around a table, eat pizza and tell it like they sit..
My challenge was to get a handle on how people we refer to as ‘bystanders’ respond to racism – not people who have overt racist attitudes, but those of us who see ourselves as tolerant and supportive of a diverse society ie: the bulk of the Australian population. Beyond the local takeaway, we don’t see race as being part of their day to day life, it’s no big deal. But without even thinking about it we will describe our neighbourhoods as being made of ‘Aussies’ and others – a sign that under the surface we are not as colour-blind as it may seem. Likewise, when we see groups of ethnic people speaking among themselves in a language other than English we see it as intrusive and imposing – ‘they could be talking about us’ is a common refrain. In all these little ways there is a sense of suspicion about things we don’t quite understand – not a hostility, more a tightening of our collective neck muscles as we work out where we stand with these people who seem different to us. Where we have personal dealings with people from different backgrounds we are overwhelmingly positive, we joke with our diverse workmates – and we see the ability to crack jokes about each other as a sign of our cohesiveness rather than our difference. But we also acknowledge there’s an R-line that exists where things stop being funny and someone is starting to feel demeaned or threatened or something worse. The tough thing when you are in the majority is knowing when that line has been crossed; you can’t know what something else is thinking, let alone feeling. And when we do see that line being crossed, it’s hard to know what to do. Most people in our groups like to think that they would step in when they thought someone they knew was being harassed by words or inappropriate jokes. But here the bigger problem emerges. We just don’t quite know what to say. Do we jump into a situation at work or on the street and inflame it, or make us a target? Or do we pull the loudmouth aside for a quiet word and risk being called PC or worse. It’s as if we have good intentions to step up but lack the tools to deal with the issue. And instead we sit back in silence, a little unsettled and embarrassed, and the person dishing out the unkind words takes it as approval. Watching these groups got me thinking about the Cronulla riots from a few years back in a way that I don’t think has had an airing before. What if the people involved never intended things to go that far? What if it was a case of a few loudmouths who took other people’s silence as support? What if no one knew how to step in and diffuse the situation? What if a whole community lost control because they just didn’t have the tools to calm things down? A few young women from the Shire participated in the groups: they were horrified and confused about their national image, embodied in this statement ‘well its racist to think everyone from the Shire is a racist”. On one level she is probably right but she is missing something – the element of power that means that those in the majority, by definition, don’t have to worry about being singled out and diminished. After a couple of decades of celebrating diversity, most Australians would hate to consider themselves racists, most of us have friends, neighbours and workmates from different backgrounds. Yet in many ways we still send out the sign that we are the owners of an exclusive club, we will let you in if you behave yourselves, but that means acting on our terms and if you do something that doesn’t meet our standards we can always show you the door. It seems to me that only thing we have to fear from naming ‘racism’ wherever we see it and being prepared to speak up, respectfully, when we confront it, is a society where everyone feels better about themselves. As one participant in the groups said on the way out: “It’s about looking at the world from someone else’s shoes and making sure you would be happy with how things are if you were there.” Atticus Finch would be proud. They Slashed Their Own Pay, Too, Didn’t They? NOT!!! You know how it goes–a company is in financial trouble, it slashes jobs to save money and, of course, the CEOs take a hit along with the regular workers. Slap, slap, slap–wake up! You’re not in Alice-in-Wonderland world. You’re in the real world, the wondrous “free market” where CEO salaries never go down, no matter how bad they screw up. Which brings us to the saga of the Sydney Morning Herald and The Australian. Mr McCarthy’s replacement, Greg Hywood, got $1.5 million for his six months in the job last financial year, while he is now eligible for a bonus of 150 per cent of his $1.6 million base salary. She used to wash her clothes and face with the same soap, said a 2008 Vogue article, and seldom wore makeup, much less luxuriated in the perks of privilege — like the private yoga classes with her friends Kathy Freston and Arianna Huffington — she indulges in today. At Yale, she would stake out Filene’s Basement to procure designer gowns on the cheap. Today, she is regularly photographed wearing Rodarte and Prada. Mrs. Murdoch quickly and giddily embraced the trappings of great wealth. While her husband conducted business in various European capitals, she would travel with him and shop for glassware and cutlery and curtains to stock her new homes. In addition to their loft in SoHo, the Murdochs transformed an old hutong in Beijing into a courtyard oasis decorated with art by Chinese artists. So, there it is: cuts are paid because of “changing conditions” or “new markets” or “new realities” but the story remains the same. The rich rob the workers who create the wealth–and, when things get rocky, the only people taking it in the chin are the very people who had nothing to do with creating the mess. Alcohol-fuelled violence is a major occupational health and safety issue for emergency service workers. You see it every weekend – a fight outside a pub, the police have to break it, ambulance officers get attacked while treating the injured, and then emergency ward doctors and nurses are left to deal aggressive drunks until they’re fit to go home. In fact, over 70 per cent of all assaults on police officers are related to alcohol-fuelled violence. The Foundation for Alcohol Education and Research’s annual alcohol poll shows that alcohol-fuelled violence is not just a problem for emergency service workers – it’s something that has affected more than three out of every ten Australian. More than one in every ten Australians has been a victim of alcohol-fuelled violence. Furthermore, 76 per cent of Australians say they were concerned about violence arising from excessive drinking. These poll results show that alcohol-fuelled violence is a national issue, and it can no longer be ignored. We simply cannot let alcohol abuse continue to play such a destructive role in our community. The view from the front-line of policing is extremely confronting. Police officers can see the human cost of alcohol-fuelled violence – the physical injuries, the emotional toll, and the sheer pointlessness of it all. Police officers, however, can also see the solution. And it’s right in front of our eyes – in the city of Newcastle. A few years ago, the NSW Liquor Administration board imposed a series of restrictions on late night trading on 14 licensed venues in Newcastle, such as 3am closing times and 1.30am lock-outs. A recent study by NSW Health showed there has been a 35 per cent decrease in the number of night-time non-domestic assaults reported to police in Newcastle since these measures were brought in. There has also been a massive 50 per cent decrease in the night-time street offences in Newcastle. These improvements have not been a flash in the pan – they have been sustained over three years, and have made Newcastle a safer place for everyone. The Last Drinks coalition has been advocating for the Newcastle experience to be used as model for tackling alcohol-fuelled violence in other communities around NSW, and around Australia. Put simply: we know we have a problem with alcohol-fuelled violence, but we also know what works, and how this problem can be brought under control. State Governments really have no excuse for siting on their hands and continuing to let boozed-up idiots run amok every weekend around Australia. 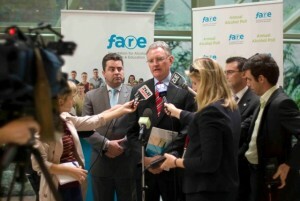 The Last Drinks coalition comprises doctors, nurses, paramedics and police officers. This article first appeared on Drink Tank 18 April 2012. By Norman Gillespie – Chief Executive of UNICEF Australia. With 89 per cent of people living in urban areas and with four of its cities making The Economist’s top 10 most liveable list (Melbourne at no. 1, Sydney at no. 4, Perth at no. 8, and Adelaide at no. 9), Australia seems to “do” urbanisation exceptionally well. Many children enjoy the advantages that urban life offers, including access to educational, medical and recreational facilities. More so than at any other time, the experience of childhood is an increasingly urban one. Over half the world’s 7 billion people – including more than 1 billion children – now live in cities and towns. By 2050, this number will jump to one in seven of all people. Cities are synonymous with economic development and opportunity, with the majority of urban growth taking place in Asia and Africa. Yet a life of opportunity is far from the reality for many children in cities. Instead, these children live invisible lives. Too many children are denied such essentials as electricity, clean water and health care – even though they may live very close to these services. Too many are forced into dangerous and exploitative work instead of being able to attend school. And too many face a constant threat of eviction, even though they live under the most challenging conditions – in ramshackle dwellings and overcrowded settlements that are acutely vulnerable to disease and disaster. UNICEF’s annual flagship report, State of the World’s Children, released today, finds that cities are failing hundreds of millions of children, leaving them virtually invisible and excluded from vital services. Child well-being averages are masking the widespread disparities that exist in cities for children’s rate of survival, nutritional status and education access. Globally, one in three urban dwellers lives in slum conditions; in Africa, the proportion is a staggering six in 10. Slums are a notorious symptom of rapid urbanisation. Children grow up often without secure tenure, birth registration, running water, adequate sanitation and surrounded by disease and poverty. In Bangladesh, the under-five mortality rate for children in slums is 79 per cent higher than the overall urban rate, and 44 per cent higher than the rural rate. From Ghana and Kenya to Bangladesh and India, children living in slums are among the least likely to attend school. And disparities in nutrition separating rich and poor children within the cities and towns of sub-Saharan Africa are often greater than the rural-urban divide. Every disadvantaged child bears witness to a moral offense: the failure to secure her or his rights to survive, thrive and participate in society. And every excluded child represents a missed opportunity – because when society fails to extend to urban children the services and protection that would enable them to develop as productive and creative individuals, it loses the social, cultural and economic contributions they could have made. Over one third of children in urban areas go unregistered at birth. Birth registration gives children a name, nationality and identity. Lack of an official identity impedes children’s access to vital services and opportunities and increases their vulnerability to exploitation. Even in Australia, significant barriers exist to the registration of the birth among Indigenous communities. The number of Aboriginal children not registered at birth is high. A birth certificate is not automatically issued to a person registering a birth. Literacy problems or a lack of confidence can make it difficult for some Aboriginal peoples to navigate the bureaucracy. This makes it difficult to prove identity, for example, to register to vote, or complete other important tasks. Yet the hardships faced by children in cities are often concealed – and thus perpetuated – by the statistical averages on which decisions about resource allocation are based. On the surface, the average quality of life continues to increase. Yet herein lies the very problem: averages lump everyone together, the poverty of some is obscured by the wealth of others. In Australia, three groups were recently identified as being particularly vulnerable to being left behind; children from Indigenous backgrounds, children in out-of-home care and children of refugees and migrants. These three groups live primarily in cities. Child and youth homelessness remains a prevailing social problem and reports show that shelters and other supported accommodation services are stretched to capacity and are forced to turn people away. Some 30 per cent of Indigenous Australians live in major cities, and a further 20 per cent live in major inner-regional towns. Aboriginal and Torres Strait Islander children have child mortality rates of three times their non-Aboriginal peers and are the least consulted in Australian policy; Aboriginal children aged 10-17 are 24 times more likely to be jailed than non-Aboriginal children and Aboriginal children are almost 10 times more likely to be in out-of-home care. These are major challenges, but they are not insurmountable. How we deal with them will prove how we develop as a fair society. We would do well to begin by asking our urban planners and policymakers to pay much greater attention to the rights and interests of children. That means bringing children’s voices into community and local government policy in the implementation and planning of cities. All this needs to be within a child-focused policy framework, sadly lacking in Australia. The unified call by Australian child rights organisations for a National Children’s Commissioner would go part of the way to address the shortfalls in oversight of policy, accountability, monitoring and participation. We must do more to reach all children in need, wherever they live, wherever they are excluded and left behind. Some might ask whether all countries can afford to do this, especially at a time of global austerity in national budgets and reduced aid allocations. But if we overcome the barriers that have kept these children from the services that they need and that are theirs by right, then millions more will grow up healthy, attend school and live more productive lives. This piece was first published on The Punch on 29 February – just as FFA Chairman Frank Lowy announced that Gold Coast United was being expelled from the A-League. 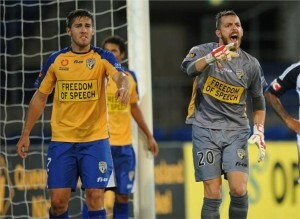 A-League football had one of its more mysterious moments on the weekend when colourful franchise owner Clive Palmer sent his Gold Coast United (GCU) team out onto the field with the message “Freedom of Speech” plastered across the front of their playing strip. Neither Mr Palmer nor his Gold Coast United CEO Clive Messink offered an explanation for the late change to the playing strip, or for the advertising billboards quoting the same slogan. The strange advertisement came after a controversial fortnight where Mr Palmer appointed a 17 year-old debutant as acting club captain, sacked the coach and lambasted FFA bosses as incompetent and overpaid. The soap opera has taken the gloss of a largely successful season in the A-League, and has left the future of the Gold Coast-based club under a cloud. But while the discussion around Gold Coast United has focussed on the erratic behaviour of its owner, the situation has exposed another issue which deserves to looked at: professional football’s reliance on the benevolence of a billionaire boys club to stay afloat. The league is increasingly operating at the behest of mining magnates. Apart from GCU, the Newcastle Jets is owned Nathan Tinkler, Perth Glory is owned by Tony Sage, and Brisbane Roar is now owned by controversial Indonesian tycoon Aburizal Bakrie. Is this situation healthy? What are the advantages and disadvantages of being beholden to a small cadre of rich men? The advantages are obvious: they have bucket-loads of cash and are happy to spend it. Running a professional soccer club is expensive, so it makes sense to call in people who can afford to do it, and who don’t mind burning some money along the way. But the disadvantages are profound, and not just when an owner ‘goes rogue’. Clubs are by nature collectives, comprising payers, members and supporters. The people need to feel a sense of belonging to the collective. When a club becomes the personal play-thing of one individual, it fundamentally loses its meaning. The disenfranchisement of club supporters was evident on the Gold Coast on Saturday night, where GCU’s supporter group – known as ‘The Beach’ – held aloft a banner that read ‘FFA save GCU’. I guess that’s freedom of speech. The reliance on mining billionaires to fund the professional game is also indicative of a mindset that has pervaded the administration of football for years – a view that football is somehow broken, and in need of a saviour. Terry Venables, John O’Neill, Frank Lowy, Guus Hiddink, Robbie Fowler, Harry Kewell and Brett Emerton, mining billionaires – the list of football’s supposed white knights is long and illustrious. And then there was the biggest white knight (turned white elephant): the World Cup bid. It’s a cargo cult mentality, a top-down approach that believes that the next big thing will come along and spark a wave of interest in professional football, and the benefits then flow through to the rest of the sport. Firstly, it hasn’t really worked. All of the people mentioned above have made a significant contribution to the sport, but A-League clubs are still struggling to gain a solid foothold in our competitive professional sporting market. Secondly, the cargo cult mentality fails to understand football’s greatest strength. Football is easily the most popular participation sport in the country. According to Frank Lowy himself, football has 1.7 million active participants in Australia. At the grass-roots level, football is absolutely flying, but the interest in football isn’t translating into an interest in the A-League. The top-down approach to this conundrum looks to impose board-room solutions. It’s about the next marketing gimmick, or about bringing in another business mate with deep pockets. But why not turn this model upside down? If we built football from from the base up, from the strong foundation that’s already in place, the game would look a lot different. In fact, it may look more like FC Barcelona – arguably the world’s most successful football club. As Social Business Australia’s Melina Morrison pointed out on this week’s 3Q program, FC Barcelona is owned and run by its supporters. Indeed there is a growing movement in the UK and across Europe of football clubs that have at least partial supporter-ownership. Clubs like AFC Wimbledon, for example, have been created by local supporters, while other groups like Dons Supporters Together in Aberdeen are organising and demanding a real stake in their local club. And, dare I say it, member-ownership is the structure used by clubs in Australia’s most successful professional football code – the AFL. Of course, the member-ownership may not be the answer to all of football’s problems in Australia, but neither is Clive Palmer. Rich people who are willing to get involved the game should be welcomed, but the game should not be reliant on them. And instead of always looking to the sky for the next big thing, the administrators of football in this country need to look down and think about the big thing that’s already at their feet: the huge community of football fans who want their game back.